Preheat oven to 180°C. Lightly coat a 20cm x 20cm pan with cooking spray, then line the base and two sides with a single strip of baking paper. In a medium bowl combine the dry ingredients for the crust (flour through salt) and mix well. Add melted butter and stir to create a soft dough. Turn dough into the prepared pan and press evenly across the base. Par-bake the crust for 12 mins until just golden. While it’s baking, make the filling. Add papaya and lime juice to a blender jug and puree until smooth. Add remaining filling ingredients (eggs through salt) and pulse to combine. Remove pan from the oven, pour filling over the hot crust and return to the oven. Bake for an additional 18 – 20 mins, until bars are puffed and firm to the touch in the centre. 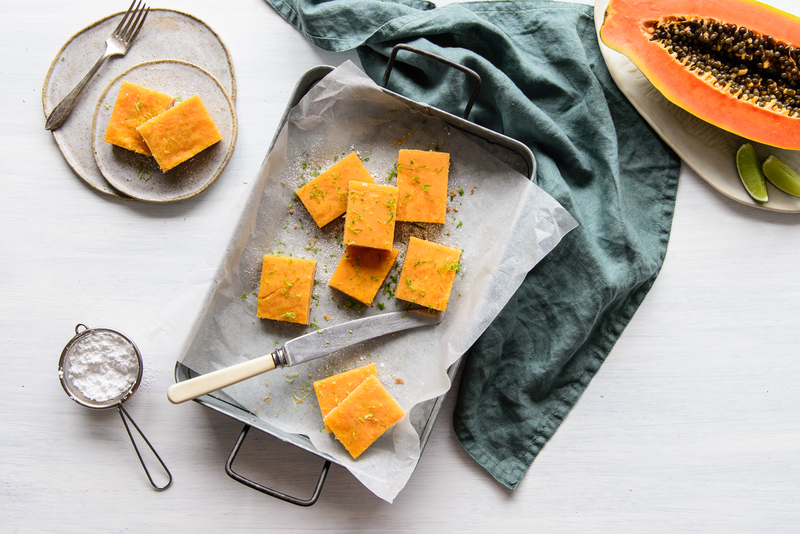 Allow papaya bars to cool in the pan for at least 30 minutes before running a knife around the edge of the slice and using the paper to lift it out onto a rack. Cool completely, then cut into bars to serve.